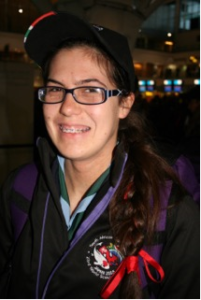 Josephine Troost is a 17 year old Scout from Stanford in the Western Cape. She has been home schooled since grade 1 and is currently completing her schooling through Cambridge. She joined 1st Hermanus Sea Scouts in 2009 but was a member of the Girl Guides prior to that. “I went to Europe with my mother when I was 11 but this is the first time that I am going overseas without my parents”, she explains. “World Jamborees only happen every 4 years and you have to be between the ages of 14 and 18 to attend as a participant, after which you can join as an adult volunteer. So as this is the only opportunity I will get to attend a World Scout Jamboree as a Scout. I am super excited to have the opportunity to take part in this adventure of a lifetime but at the same time I’m really nervous because I have never been away from home for this long before. I feel like I have butterflies in my stomach from excitement and a tape running in my head constantly asking me, what if this happens? What if I forget that? What am I going to do if I forget something important? And a million other questions. I guess it will all be fine once we are on our way.” Says Josephine with a smile. 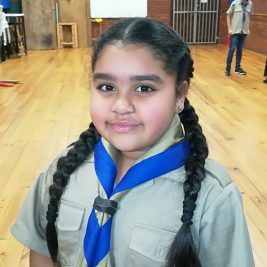 “I am most looking forward to meeting and making friends with Scouts from other countries and experiencing other cultures within the framework of the Scouting system. I also love history so I am looking forward to learning more about Japan on our pre Jamboree tour in Tokyo and Kyoto” says Josephine. In preparation for the trip Josephine has been reading any and all information sent out by the leaders of the SA contingent and has been talking to other Scouts who are going to this Jamboree or have been to previous Jamborees. She has also been researching the places they will be visiting.